Summer is the time for absorption pasta. No huge pot of boiling water on the stove heating up the kitchen. Everything cooks up in one dish, making for less cleanup. It's extremely adaptable; you can use whatever you happen to have available in your pantry. A recent trip to Trader Joe's left me with a bag of frozen artichoke hearts in my freezer. Fresh peas rounded out the flavor and added a touch more green. As usual, I used whole wheat pasta. It takes a little longer to cook, but that's the only difference. Since I started making my own pasta I have felt conflicted about using all-purpose flour instead of whole wheat, but I wanted to get it down with the AP flour before I start experimenting with whole wheat. I also recently read somewhere that pasta, even with all-purpose or semolina flour, is considered a complex carbohydrate because without the yeast the flour is dense and takes longer to break down. I hope that's true, because there some times when whole wheat pasta just doesn't do it for me. But in this case, it works just fine. Heat oil in medium-sized saucepan over medium heat. Add onion and cook until transparent, about 5 minutes. Add garlic and pasta and cook for 2 minutes more. Add just enough water to cover the pasta, about 1 cup, then add the thyme, oregano and basil. Lower the heat to a simmer, cover the saucepan and cook for about 15 minutes, checking the water level periodically and adding more if the pan looks too dry. While the pasta is cooking, combine the artichoke hearts and balsamic vinegar in a small bowl with salt and pepper to taste. Let sit while the pasta is cooking. 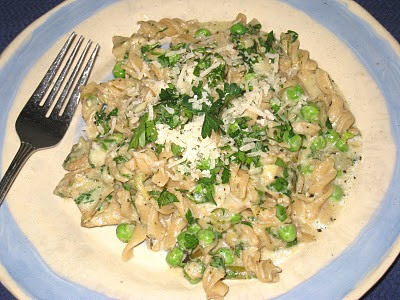 When the pasta is al dente and the water has almost evaporated, add the artichoke hearts with the balsamic vinegar and the peas. Raise the heat to medium high and cook, stirring frequently, until the water has turned into a thick sauce, about 1 minute. Lower heat again and add the cream, cheese and parsley. Stir until the sauce has the desired consistency, adding more hot water if necessary. Season to taste with salt and pepper. Garnish with additional parsley and cheese.